Today I've got a bit of a treat for anyone in the North East loving a good food bargain. 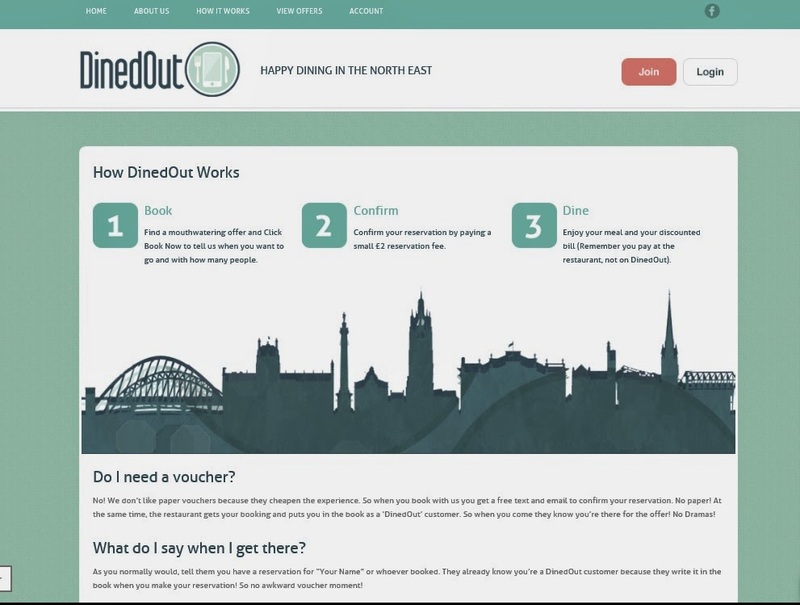 Dined Out is a website run by two Northumbria University students, Andrew and Liam. 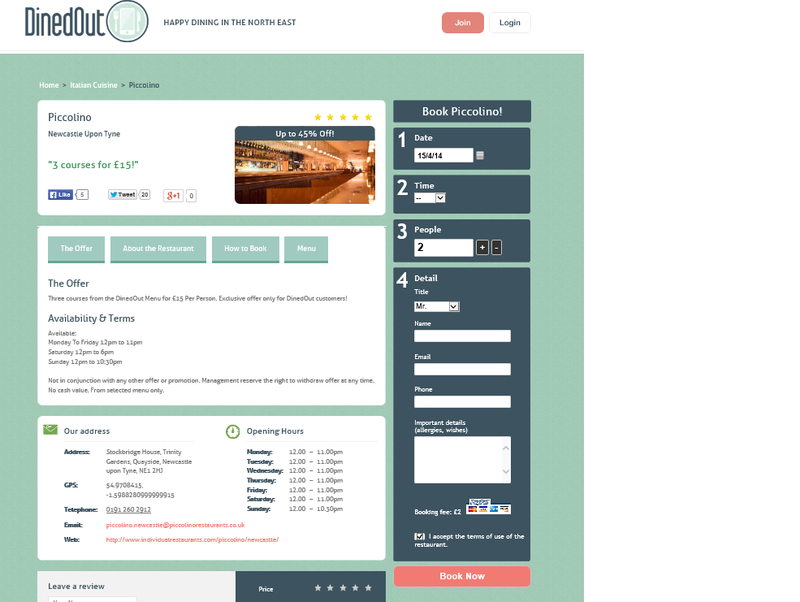 They spotted a gap in the North East market for a website that offers the customer a combined service of making a restaurant reservation whilst taking advantage of special unique promotions. Having lived in London, I know how successful similar sites in the capital are and the North East was really crying out for something similar considering the amount of lovely restaurants that we have up here. The guys have worked hard to get some really good deals on Dined Out, their intention is to give food lovers the chance to indulge in an exclusive dining experience that they won't find elsewhere. Some of the names on board include Peace and Loaf in Jesmond where you can get 2 courses, a side and a drink for £15.95, newly opened Restaurant DH1 in Durham which is offering 3 courses for 2 and Quayside favourite Gusto where you can get a lunch course and glass of wine for £9.95. There are many other gems to be found and more and more restaurants are getting involved as the weeks go by. The beauty of Dined Out is that unlike other restaurant deals you don't have the hassle of printing off a paper voucher and you don't need to mention the deal to your waiter. Dined Out does all of the hard work for you so all you need to do is book your table online, pay a small £2.00 booking fee, show up, enjoy your meal and automatically receive your discounted bill at the end. Dined Out fits perfectly with modern day living, being able to book a restaurant online whilst sitting on the Metro is exactly what we need. Simon and I gave Dined Out a try last week and our biggest challenge was trying to pick which restaurant offer to go for, quite a few of them were on my list of places I'm still to try so I was a little spoilt for choice. In the end we decided to go to Piccolino for the 3 courses for £15.00 deal. I've heard great things about Piccolino so I thought it was about time we gave it a go. We turned up at the restaurant and gave our name and were then automatically given the special Dined Out menu without even having to mention the deal. Sometimes set menus can be a little restrictive but the Dined Out menu at Piccolino was really impressive. The first course was Tuscan and Rosemary Breads with olives and then we had a large choice of starters and mains to pick from. There were at least three dishes in each course that I wanted to try so we certainly weren't limited in our options. 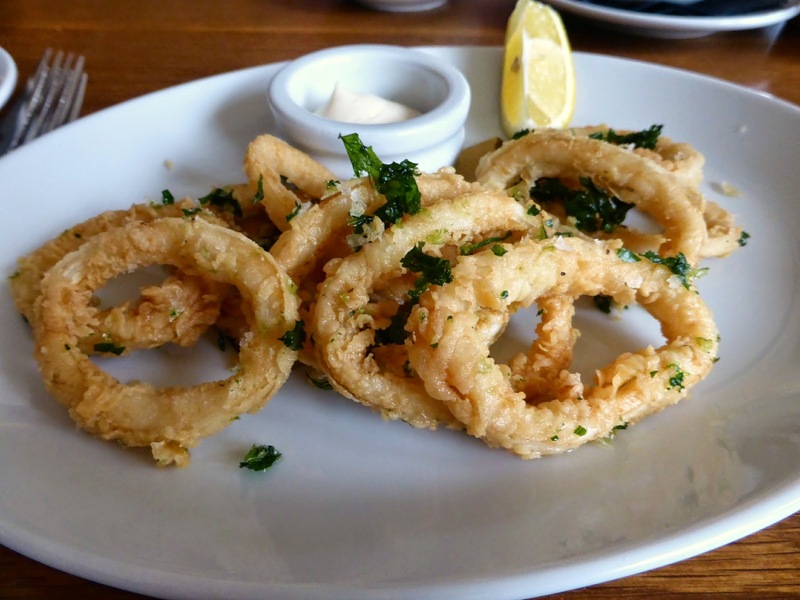 For starters I had Fried Calamari, quite often I find that calamari is caked in too much batter but this dish was perfect with a great light coating - leaving me room for my main course. Simon went for King Prawns sitting on Ciabatta swimming in a lovely chilli butter sauce, I'm not a huge fan of spicy food but I tried a small mouthful and it wasn't too hot so I was quite jealous because it was delicious. For the main course Simon opted for the Grilled Chicken Breast which he ordered with a side dish of potatoes. He got such a generous portion that I decided I needed to help him out with them so I tasted a few and they were seriously yummy. I had the Funghi and Prosciutto Pizza which was as large as my plate but I still managed to eat every last bite. I'm thoroughly impressed with Dined Out, having befriended them on Twitter before their launch I know how hard they have worked to get their venture off the ground and it's lovely to see that the site works so well. I will definitely be using Dined Out again and am so excited to see what other restaurants and deals get added to the site as time goes on. So next time you're wanting to treat yourself to a meal out without breaking the bank why not have a look at the Dined Out website to see what offers tempt you, or even better sign up to the mailing list here so you never miss a deal! I was invited by Dined Out to try out their website. They paid the cost of my meal and we paid the cost of Simon's. All thoughts are my own honest opinion. Sounds like a great site! Who doesn't love a great meal for a good price :) the food in your pictures look delicious! It is, I can't believe no one else up here has thought of it before ... clever boys! It was! and have you seen that huge bowl of potatoes?! He thought he was only going to get a few! I need to go back .. just to try the desserts, I had a look and they looked really good! That is funny! I almost ordered the Seabass, but the pizza sounded too good to resist!